For more than 30 years, Wyoming artist Neltje (American, b. 1934) has explored a variety of materials and media to visually express her life and experiences. Her earliest paintings incorporated found objects, she explored composition through collage and assemblage, and she learned the creative expression of line through sumi-e ink drawing. All of her research in these media, combined with her literary writing and her strong emotions, has been the underpinning of her primary mode of expression: painting. Neltje. Painting. 1990 – 2012. is the first exhibition to explore the evolution of her work in this media. 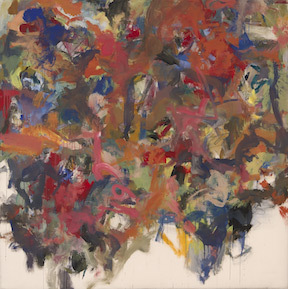 Subjects have evolved from landscape to figurative to abstract expressionism. Palettes have progressed from dark and somber to bright and clear. The scale of her paintings has always been large but her most recent Moroccan Suite establishes a new dimension to her large-scale work: 10 x 30 ft. Funded in part by FMC Corporation, Rocky Mountain Power, Wyoming Public Media, UW Art Museum Gala Funds, and the Wyoming Arts Council through the Wyoming State Legislature and the National Endowment for the Arts. Neltje. Painting. 1990 - 2012. is the first exhibition to explore the evolution of her work in this media. 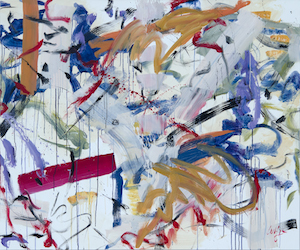 Subjects have evolved from landscape to figurative to abstract expressionism. Palettes have progressed from dark and somber to bright and clear. The scale of her paintings has always been large but her most recent Moroccan Suite establishes a new dimension to her large-scale work: 10 x 30 ft.